What Is Flat Iron Steak? The flat iron steak has gained popularity, now appearing in grocery stores and on restaurant menus as a good alternative to more expensive steaks; it is nearly as tender as a tenderloin at a fraction of the cost. Flat iron steak—also known as a top blade steak, top blade fillet, and shoulder top blade steak—is cut from the shoulder of the cow (called the chuck) and is nicely marbled with lots of beefy flavors. When cooked properly, a flat iron steak turns out tender and juicy. Originally part of the top blade roast, the flat iron was born as a result of the tough connective tissue that ran through the middle of the cut of meat. Once this was removed, the two pieces were treated separately, one becoming the flat iron steak, the other called the top blade steak. The flat iron (supposedly named because it looks like an old-fashioned metal flat iron) is uniform in thickness and rectangular in shape. The nice amount of marbling creates a steak that is extremely tender and full of flavor. It is best when cooked on the grill and can be incorporated in a variety of recipes. Since flat iron steak is not as well known as flank steak, it is easy to confuse the two. However, they are very different cuts of meat, beginning with the part of the cow from which they come. Whereas the flat iron steak is cut from the chuck primal—the shoulder area of the cow—a flank steak is cut from the belly muscle, called the flank primal. They are both flavorful and tender, but the flank steak is leaner than the flat iron. The distinctions also reach to their ideal cooking methods; both steaks benefit from marinating, but since the flat iron is a thicker, denser cut of beef, it is best when cooked to just medium rare. A flank can be braised and is often used for steak fajitas and carne asada. What Does Flat Iron Steak Taste Like? Because of the marbling, flat iron steak has a rich flavor that is described as "beefy." Although flavorful enough to be enjoyed on its own, this type of cut benefits from a marinade and often takes on the flavors of the ingredients it is combined with. The flat iron steak is quite versatile, delicious simply coated in oil and salt and thrown on the grill, as well as cooking after some time in a flavorful marinade. Because of its muscular structure, it is best if it isn't cooked beyond medium; the recommended doneness is medium-rare, or around 135 F (60 C). This steak is perfect for the grill as the high heat and short cooking time really bring out the rich flavor of the meat. The flat iron is very similar to any of the flat steaks, so any recipe calling for skirt or flank steak will be the perfect opportunity to try the flat iron steak. This cut is best grilled over medium-high heat; don't go as hot as possible unless you pick up a particularly thin cut. Because of the density of the meat, it is generally ideal to start with a quick sear before moving to a lower temperature to finish off to the desired doneness. The steak's deep, rich flavor makes it perfect not only on its own but also as meat for many dishes, such as steak tacos and hearty sandwiches. To enjoy the steak as is, try it grilled after marinating in a mixture of rosemary and red wine, or in a spicy chili rub; or grill the steak coated with a bit of garlic and then top with spicy lemon pesto. If your butcher stares blankly at you when you ask for a flat iron steak, it might not be because he’s a bad butcher. It could be that this particular cut (or actually this particular name) hasn't caught on in your neck of the woods. If requesting a flat iron steak isn't successful, ask for a top blade steak. If it is still unavailable, try your best to track one down and give it a taste. You might just find your perfect steak. Raw meat doesn't have too long of a shelf-life, so plan on cooking the flat iron steak within 3 to 5 days of purchasing it and store in the refrigerator until ready to prepare. Make sure it is wrapped well without any extra air inside the packaging. If you need to keep for later use, remove from the store packaging and rewrap in a freezer bag or butcher paper, removing any extra air. The steak will stay fresh for at least 3 months or longer. As with most cuts of beef, flat iron steak is high in protein and zinc; in a 3-ounce serving, you will find 23 grams of protein and half of the daily recommendation of zinc. It is also a good source of iron with 15 percent of recommended daily values. 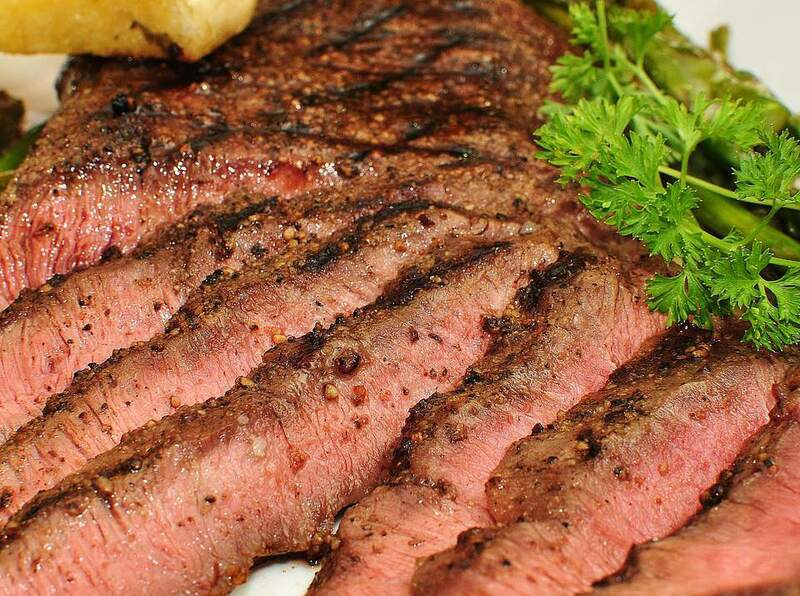 There are 180 calories and 3.8 grams of saturated fat in a 3-ounce serving of flat iron steak.